The key for most artists and entrepreneurs is finding cheap or just outright free materials to work with. The main problem with both of these is that most of time the material you find, or is given to you, looks like crap. It might even be covered in it. Fortunately, there’s a tool that can make your life so much easier, when it comes to cleaning off such nastiness. The tool I’m talking about is a wire cup brush that attaches to your angle grinder. 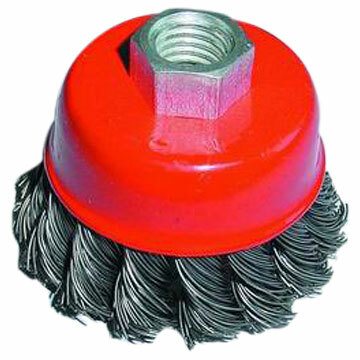 Whether it’s just something simple like removing rust quickly or something a little more involved like removing 8 layers of old paint, a wire cup brush attached to your grinder will take care of it all. I’m going to show you how to attach and use a cup brush on your angle grinder. You’re going to see how fast and easy it is to use and the huge difference it makes in reviving old metal. The great thing about these attachments is that you can find them in just about every hardware store. I usually get mine from Home Depot or Lowes, but smaller places like Ace Hardware always have them as well. Of course, any welding or metal supply places are going to have them. Do you have any old scrap laying around just building up rust? Or maybe you’ve got a bunch of cool tractor parts laying around just waiting to be turned into something. Take your cup brush to them and turn them into something beautiful again. You’ll be amazed at how just seeing the metal in a new light will inspire you with new ideas of what to make with it. I want to hear what you’ve cleaned up and how it’s inspired you. Let me know by leaving a comment in the comment box for this post. If you do, let me know by leaving them in the comment box.